This entry was posted in art and tagged art, GIMP, hack4dk, Rigsarkivet. Yet another Paul Fischer remix. This entry was posted in art and tagged art, GIMP, hack4dk. For recent hack4dk I made photographs from the same viewpoint as some classical paintings and blended the original image with the new photo. My first attempt with the old Copenhagen Jailhouse was not completely satisfactory. 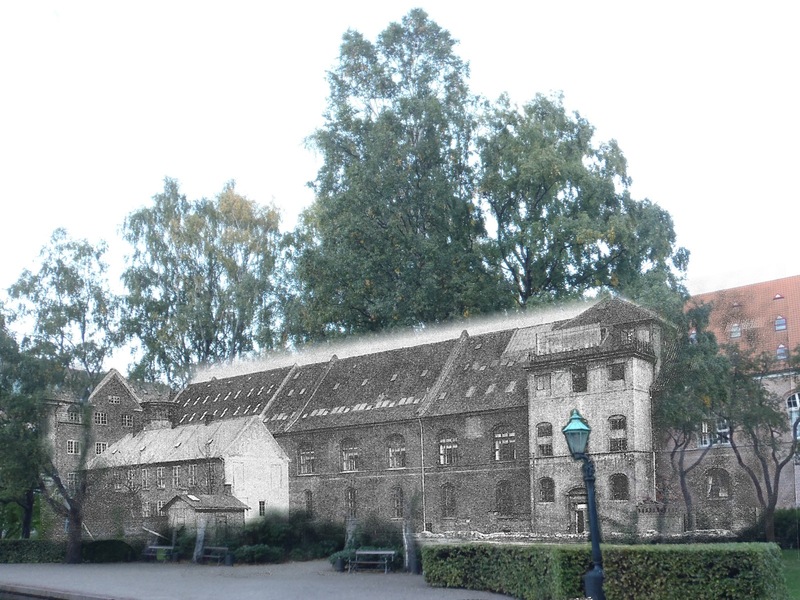 One problem was with the guards red skilderhus at the right side of the image. I have now corrected this. Another problem was with the road sign that in my original remixed image floated in midair. I also exposed the lamp in the middle of the image a bit better. Henrik, Andreas and …(? ), mail art mail box. Mobil app with public art. List of nearby art shown with photos and on maps. Steen Thomassen: Join the Danish Wikipedia and the Danish film database, e.g., for Tommy Kenter. The useful tool is running from Wikimedia Labs server. Winner became the heatmap movie with Kræn’s Natmus Mosaic viewer as runner up. This entry was posted in programming and tagged hack4dk. 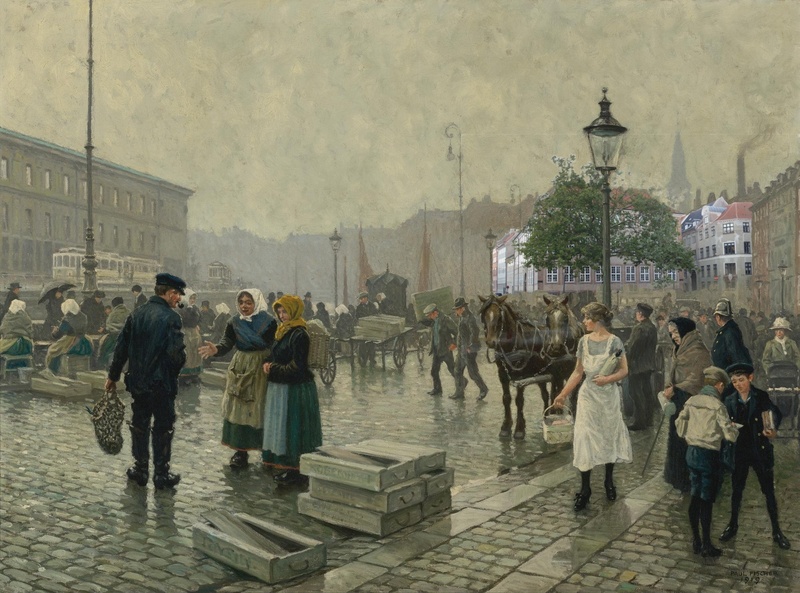 Danish painter Paul Fischer painted urban scences from Copenhagen. One of them is a painting with the fishmongers from Gammelstrand. This entry was posted in art and tagged hack4dk. 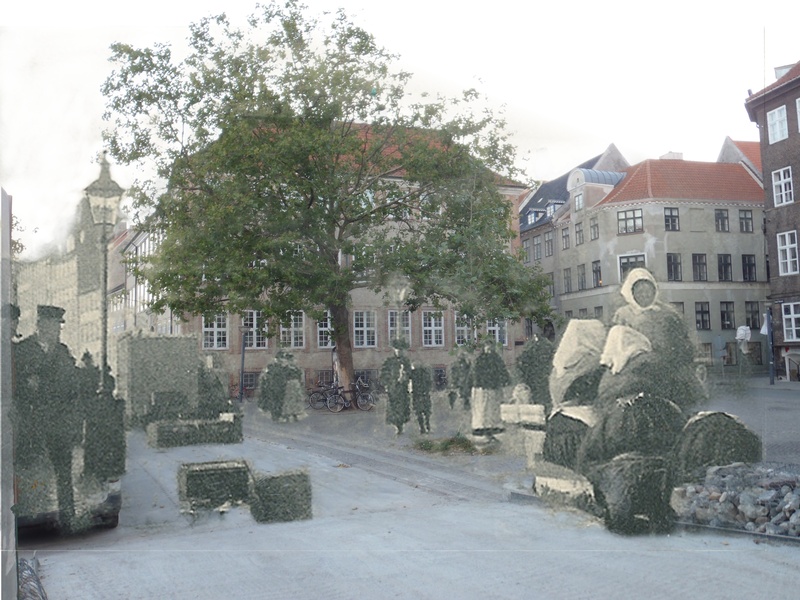 The Wikimedia Commons catetory History of Copenhagen has a number of old photos, drawings and paintings of old Copenhagen. For some of these images I can locate the viewpoint. 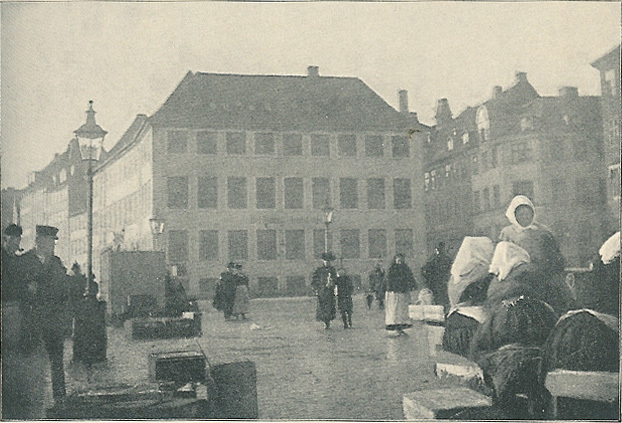 One of them is from the central street Gammelstrand showing a square with the building Assistentshuset with fishmonger, standing men and walking people. The uploader labeled this as by Alb. Gnudtzmann & Helmer Lind and from 1907 while the description. According to the Danish bibliographic lexicon a “Albert Gnudtzman” was a writer and “Helmer Lind” is claimed to be a journalist who together with Gnudtzman wrote “Stor-København, presumable a book. I suppose the image is a photo from the book. The site of the image is relatively easy to find. 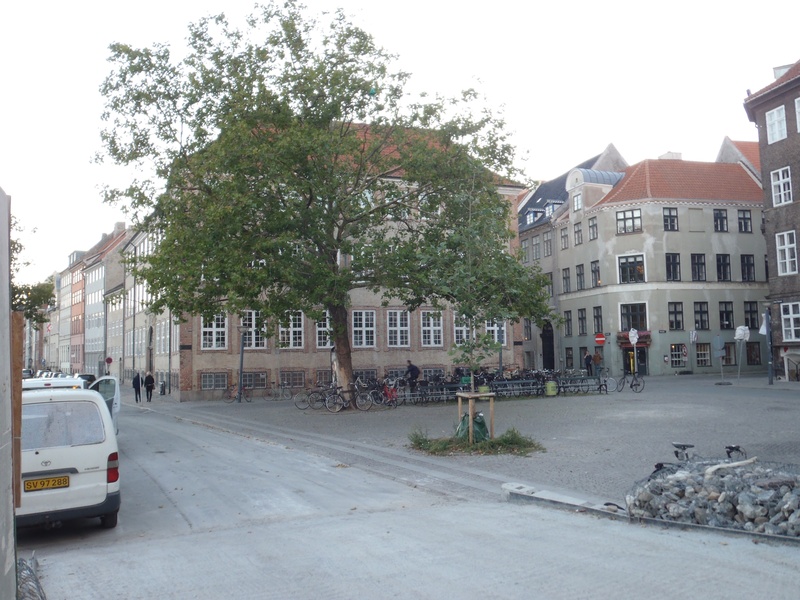 It is not far from hack4dk 2013 site at the National Museum. The houses are still there. A big tree now grows in the front of the central building. In the foreground of the picture is ramp to a big sculpture called “Metrobyggeriet” that presently covers much of Gammelstrand. One spooky thing appear on the very right of the images. I count two and half visible windows on the front-facing wall on the red-roof building in the old photo and four windows in my 2013 photo!? How on earth did that happen? Am I standing the wrong place? Have the buildings been moved? This entry was posted in art and tagged copenhagen, hack4dk. Danish SMK museum released some time ago a batch of high-resolution photos of paintings in their possession, – now being available on Wikimedia Commons. 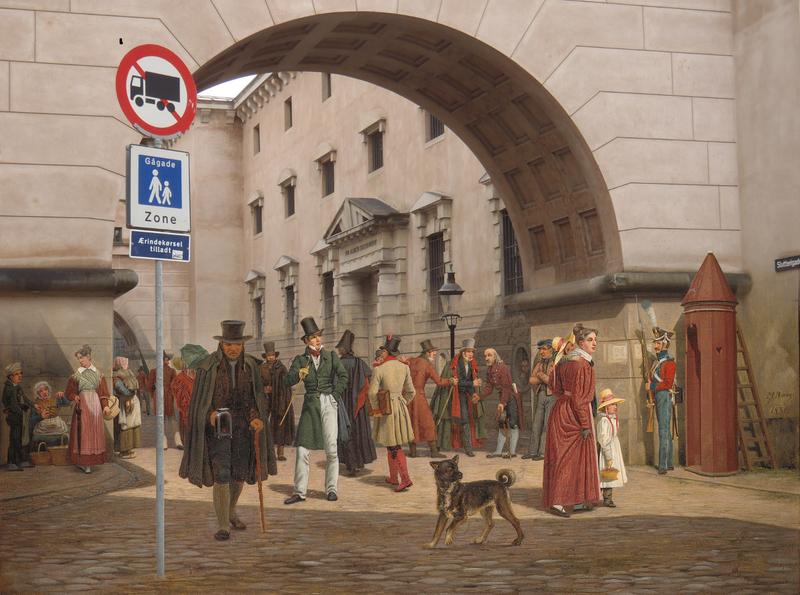 One of them was Martinus Rørbye’s painting of the jailhouse in Copenhagen from 1831. Last year I took a photo from the same spot that Rørbye had his viewpoint. Now I finally got around to “remix” these two images together. My result is listed here below. I choose a rather simple method for blending the two images: They are just blended with a gradient in the vertical direction. This approach is straightforward in GIMP – provided you know which buttons to press. The simple approach makes some artifacts. The small shelter for the soldier on the right is missing the upper part while the sign on the left of the image floats freely in space. I also had to align the two image. i haven’t found a convenient way to do this with GIMP. You see a misalignment to the left where the wall behind the standing woman with the basket appear with a shadow.